Ibrahim Mohammad ’17 came to the Hajim School so he could learn to build water purifiers and electrical generators for his refugee camp in Lebanon. “My purpose in life is to help people,” he says. 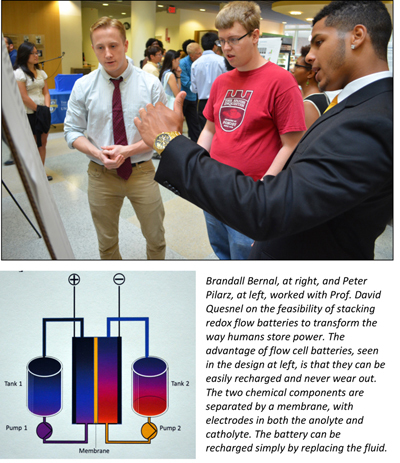 This summer, he found another way to do that as a Xerox Engineering Research Fellow under the mentorship of Doug Kelley, assistant professor of mechanical engineering. Mohammad and visiting student Danielle Laiacona, a rising senior at Binghamton University, built a laboratory model to simulate the movements of the inner ear’s hair cells, which convert sound-generated vibrations of inner ear membranes into electrical signals that go to the brain. The project is in collaboration with assistant professor Jong-Hoon Nam of mechanical engineering, who recently received a National Institutes of Health grant of up to $1.8 million to study the biomechanics of the inner ear’s organ of Corti. Nam hopes his study will lay the groundwork for eventual hearing aids or implants that are better customized to the needs of individual patients. The Xerox Engineering Research Fellows program, administered by the David T. Kearns Center for Leadership and Diversity, is a collaboration with the Hajim School and Xerox Corp., which provides funding. During the summer before their junior or senior years, participating Hajim undergraduates receive an intensive lab-based, mentored research experience. Many continue their project into the fall as a faculty-advised independent study course for credit. Since its inception six years ago, the Xerox Engineering Research Fellows program has enrolled more than 130 Hajim School students. Sixty-nine percent of its graduates have gone on to graduate school, of which 40 percent are currently enrolled in a PhD or other doctoral program. Danielle Benoit, associate professor of biomedical engineering, has mentored 10 Xerox Fellows—more than any other Hajim faculty member. “It’s an outstanding opportunity for everybody involved,” she says. For the Xerox Fellows, the hands-on research and lab work can “really open their minds in terms of opportunities they will have after graduation,” she says. For the graduate students who help mentor Xerox Fellows, there’s an opportunity to “develop their own mentorship and pedagogic skills within a lab setting, which is especially important for PhD students who will ultimately end up having their own research groups, whether in academics or industry,” she adds. And for Benoit? “For me, part and parcel of being a faculty member here is to teach on multiple levels—not just in the classroom but also in the lab, where I can teach undergraduate and graduate students alike the best, cutting-edge research practices.” The Xerox program allows her to do that one-on-one, to a much greater degree than 20 or so students receive in a lab section associated with a traditional course. And make no mistake: There is nothing “token” about the research these scholars perform. “More often than not they give back as much as they get—if not more so—not only in the data they produce but also in the new ideas and experimental approaches they develop,” Benoit says. Recent graduate Tim Felong ’15, for example, pursued a novel approach to regenerating salivary gland cells using progenitor cells during his Xerox Fellowship in Benoit’s lab. “Some of the results he’s shown are striking and are driving his current experiments and will underlie future experiments of others in the lab,” Benoit says. Caressa Chen, now a medical student at the University of Buffalo, said her 2012 Xerox fellowship in Benoit’s lab benefited her in “countless ways.” For example, the Kearns Center helped her with professional development and networking skills. 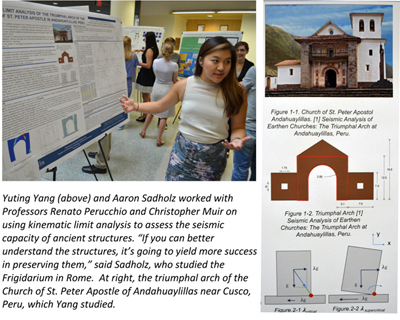 She learned a lot about biology, lab techniques, engineering concepts – even how to prepare an effective research poster. She formed lasting friendships with her lab mates. She continues to regard Benoit and the grad student who supervised her as mentors. Now he’s considering it. The Xerox Engineering Research Fellowship program has shown him the possibilities that graduate study can open up for him, such as pursuing advanced research in renewable energy—and figuring out a viable way to provide electricity to that refugee camp in Lebanon. The selection of Xerox Engineering Research Fellows is highly competitive. To learn more, click here. At left, Comfort Adeyemi, a biomedical engineering undergraduate and 2014 Xerox Engineering Research Fellow, worked on "Biomechanical Properties of the Limbus" with her faculty mentor, Asst. Prof. Mark Buckley. Jenny Won, also a 2014 fellow, worked with Prof. Jannick Rolland on assessing the opththalmologic applications of Gabor-Domain Optical Coherence Microscopy—for example, measuring the edge thickness of soft contact lenses.